The Montagna di Sale by Mimmo Paladino was designed in 1990 as a prop for La sposa di Messina by Friedrich Schiller, directed by Elio de Capitani and shown in Gibellina. 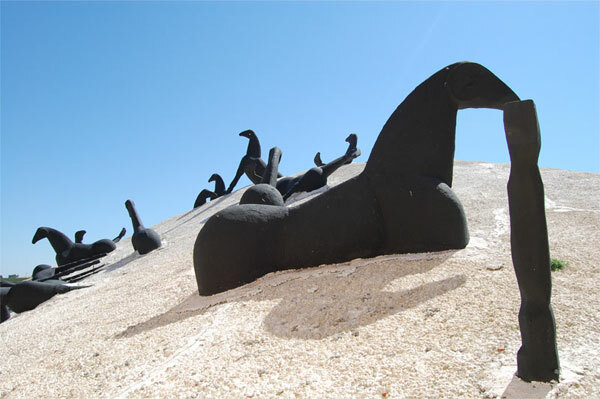 The mountain, made from cement, plastic reinforced by incorporated fibreglass and crushed stone, is a background to thirty horses made in wood- recurrent animals in works by Paladino. The work underlines the animal instinct in an exultation of strength and passion. The Montagna di Sale was duplicated and exhibited in Piazza del Plebiscito a Napoli, where it had a notable success. Mimmo Paladino is a great contemporary artist. Born in 1948, in the’80s he was one of the main exponents of the Transavanguardia, a movement theorized by Achille Bonito Oliva as a reaction to the conceptual art of the’70s. Today he exhibits in the main international centres of contemporary art (some of his works are to be found in the Museum of Modern Art of New York).